Yesterday, I had a random free hour in my day (what?) and I decided to stop by the Notable Children’s Books discussion. It was so inspiring to hear such intelligent, funny and thoughtful librarians critiquing some of the most interesting books of the year. If you’re at ALA, I would recommend listening in on their discussion. They meet from 1-4 today and 1-4 tomorrow in room 3022 W at the Moscone Center. If you’re at home, just go read Sidewalk Flowers (by Jon Arno Lawson and illustrated by Sydney Smith). Then read it again and talk to all your favorite people about it. This will get you closer to replicating the Notable’s experience! After my last meeting of the day, I went straight to my hotel, removed my snow-covered boots and sat down on my bed. Part of me wanted to stay in my cozy spot, but I’d told a colleague I’d meet her at the ALSC and YALSA Joint Member Reception. So I figured I’d better put my boots back on. And I’m very glad I did! In addition to catching up with my colleague, I got to see some other familiar faces and meet a few new brilliant librarians. 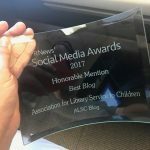 I loved getting to hear about everyone’s conference highlights and favorite Youth Media Award recipients. Whenever I am in the presence of a large group Children’s and Teen Librarians, I am astounded by their vast knowledge, passion for their work and openness to new ideas. What a perfect a way to end my conference.